On March 30th, we held another session of our second public working meeting around the theme of Housing. Our first iteration of this meeting was held on February 11th; due to lower-than-usual turnout, we felt it was important to have another opportunity for residents to voice their opinion on this important subject. Combined, these meetings engaged more than 100 people. 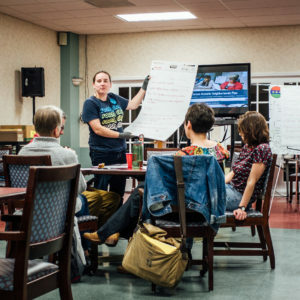 At the March 30th meeting, residents discussed existing market conditions, residential stability, landlord and tenant rights and responsibilities, community building, and tools and partners. In small group discussions, participants reviewed information and developed strategies and goals to address the needs of our neighborhoods. You can check out the data and community input by clicking the links above. COMMUNITY OWNERSHIP will be our future! Our neighborhoods want to align resources and partners to ensure future development is locally owned and residents organize against speculation and discrimination. Housing policy must PRESERVE OUR DIVERSITY! 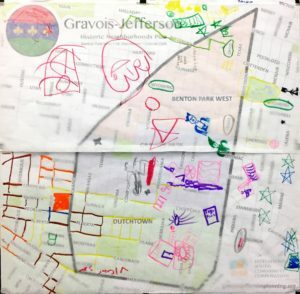 The Gravois-Jefferson Plan must lay out strategies to preserve socioeconomic and racial diversity, such as affordability requirements for new developments and developing tools to empower homeownership among low-income households. COMMUNICATION AND COORDINATION are integral to success! We need to work with residents and partners to increase awareness of policy and opportunity — this includes fair housing, marketing, training opportunities, and more. If you didn’t have the opportunity to attend, you can also participate online in all the activities from the meetings by clicking here. In addition to our most recent working meeting, we have met with local youth at Carnahan HS, Roosevelt HS, and the Thomas Dunn Learning Center, convened a group of local stakeholders with interests in youth empowerment, and facilitated planning activities with the Amigas Latinas group. We are always happy to come and talk with you or your group – just let us know! In the coming weeks, we look forward to carrying out our “Resource Group” strategy, checking in with the Vietnamese elders, and planning our third public working meeting. On Thursday, March 16th, staff from Rise and DSCC facilitated a table and interactive mapping station during the parent-teacher conferences at Carnahan High School of the Future, located at 4041 S Broadway. Dr. Racette, the principal, has been active in our youth resource group, and graciously invited us to meet some of her teachers, parents and students. We had the opportunity to distribute flyers to more than 50 parents, and engaged a dozen youth in conversations about their neighborhoods. We also gathered nine responses to our youth survey, asking students what they see as the strengths and challenges in the neighborhood, what kind of services or programming they need, and what question they would ask of other young people in their community. When asked about what would make their neighborhood a stronger, more supportive environment, they consistently said that we need to end the violence and clean up our streets. Finally, every student said that they want to be a part of improving their neighborhoods. On Thursday, March 9th, Rise and Dutchtown South Community Corporation staff went to the weekly meeting of Amigas Latinas to share information about our planning work and to hear about their priorities and vision with copies of a survey translated into Spanish and assistance from a translator. Sra. Rataj and the team at St. Francis Community Services Southside Center deserve special shout-outs for their hospitality and commitment to our neighborhoods. Founded in 1983, St. Francis Community Services addresses the immediate needs and systemic issues for all, while specializing in Vietnamese and Latino communities in the St. Louis Metropolitan Area. SFCS seeks to raise respect for heritage and engagement within and among cultures in a strength-based process of equipping clients with the skills necessary to be resilient. From our conversation with the women and their survey responses, we learned that a key strength is connection with neighbors, location and diversity. Additionally, the vast majority of the women felt children in their family receive high quality educations. We also learned that ALL of those who responded to the survey would be interested in starting their own business, but do not have the resources necessary. A key strategy would be support for local minority-owned businesses and apprenticeship programs for local youth. According to survey responses, many of the Amigas do not feel safe walking around the neighborhood. Proposed solutions include more foot police, neighborhood walking groups, and cleaning up vacant and abandoned properties. We also discussed how all have the desire to engage in their communities and neighborhood groups, but struggle with the language barrier – flyers and meetings are in English. We are immensely grateful for the opportunity to meet and discuss our efforts with the Amigas Latinas, and look forward to a continued conversation. On the evening of March 8th, 2017, the Gravois-Jefferson Historic Neighborhoods Steering Committee came together for their fifth meeting. Six of fifteen members were in attendance, as well as staff from Dutchtown South Community Corporation (DSCC) and Rise Community Development (Rise). You can find the meeting’s agenda here. We began the meeting by delivering an overview of the second public working meeting, focusing on housing. You can view that summary and additional information on the second iteration of that meeting here. Each steering committee member then revisited the strategies and priorities we discussed at our last meeting and vetted the proposed “Resource Group” strategy, an effort to involve stakeholders in plan development, effectively increasing communication among partners, breaking down silos, building support for strategies, and sparking implementation. They also connect trained practitioners with passionate and engaged community members to develop cross-scale relationships and build a platform for sustained change. We concluded by distributing canvassing materials, reviewing the agenda for the upcoming working meeting #2 part 2, and completing feedback forms. 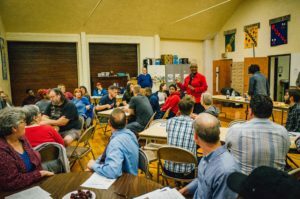 Last week, we had our second public working meeting around the theme of Housing. At the meeting, residents discussed existing market conditions, residential stability, landlord and tenant rights and responsibilities, community building, and tools and partners. In small group discussions, participants reviewed information and developed strategies and goals to address the needs of our neighborhoods. You can check out the data and community input by clicking the links above. COMMUNITY OWNERSHIP is key! Our neighborhoods want to align resources and partners to promote a Community Land Trust and resident-led rehabilitation of vacant properties. We need these conversations to BENEFIT EVERYONE! We have consistently heard a need for training and educational programming as tools to improve landlord-tenant relationships and quality of rental housing stock. We realized many did not have the opportunity to attend the last meeting, so we will be hosting a second gathering for the Housing Working Meeting. Stay tuned for details. In the meantime, you can also participate online in all the activities from the meetings by clicking here. In addition to our most recent working meeting, we have met with the area Aldermen, convened a group of local stakeholders with interests in youth empowerment, and facilitated planning activities with the congregation at Curby Memorial Church. We are always happy to come and talk with you or your group – just let us know! In the coming weeks, we look forward to meeting with youth leaders to develop a youth engagement strategy, speaking with the local Amigas Latinas group, and checking in with our fantastic business community. 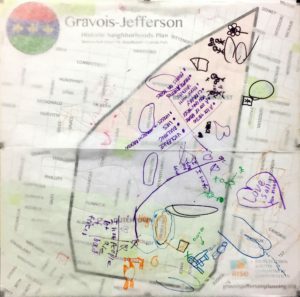 On the evening of February 1st, 2017, the Gravois-Jefferson Historic Neighborhoods Steering Committee came together for their fourth meeting. Seven of fifteen members were in attendance, as well as staff from Dutchtown South Community Corporation (DSCC) and Rise Community Development (Rise). You can find the meeting’s agenda here. Each person then shared with the group what they saw as priorities in the community feedback. Specifically, three strategies within each category, one of which they think the Steering Committee can help champion. The list of these prioritized strategies can be found here. We look forward to working with this group and the greater community to carry these strategies forward. We then asked the Committee to participate in a community history exercise, where we mapped the highs and lows of the neighborhood. This exercise was important in helping inform the memory of this community, and ensure our recommendations take into account the successes and challenges of our past. We will be bringing this activity to future events so that more people can add their stories to the community timeline. We concluded by distributing canvassing materials, reviewing the agenda for the upcoming working meeting #2, and completing feedback forms. On the evening of Monday, December 19th, the Gravois-Jefferson Steering Committee convened at La Vallesana Restaurant for an informal meetup and debrief session. We began by welcoming the newest member of the Committee, Nha Nguyen. Members of the Committee discussed a variety of topics, including plan progress, key priorities, and actionable recommendations. You can find the meeting’s agenda here. Staff from Dutchtown South Community Corporation (DSCC) and Rise Community Development prepared canvassing materials so that Committee members could help get out the word for upcoming meetings. You can download these materials here, or get printed copies by contacting us here. Planning team staff also brought summaries of past community engagement efforts. Members of the Steering Committee expressed the desire for short-term action steps to be taken to help accomplish the goals being set out my local residents. One of the strategies that stood out was a “Community Welcome Center” concept that would greet new residents to the neighborhood by providing them with knowledge of local resources and organizations. These welcome packets could include information on who to contact in certain situations, as well as the sort of amenities and attractions that exist in the Gravois-Jefferson area. We appreciated the opportunity to talk informally with the Steering Committee over delicious nachos and salsa. We look forward to continuing these relationships and working together to realize key goals. On the afternoon of December 19th, a group of Black Business Owners came together at YeYo Arts Collective to network with other business owners and learn from a panel of business leaders and industry professionals about how to grow and sustain their business. Co-hosted by Out Hrr Events, Dutchtown South Community Corporation and Rise Community Development, the event provided a platform for business owners to discuss their ideas and vision, as well as ways to collaborate — all of which will be incorporated into the Gravois-Jefferson Historic Neighborhoods Plan. Our next steps include surveying a few more Black-Owned Businesses who could not attend and continuing to amplify the great work of our local businesses. If you have ideas forfuture meet ups, promotional events or collaborations, don’t hesitate to reach out!